THE Labour Movement held its first U Startup Day on Thursday to officially launch its U Startup initiative to meet the needs of the local workforce and startups looking for talent. Introduced last year by the National Trades Union Congress (NTUC), the U Startup initiative leverages the Labour Movement's network to benefit the startup community. It provides targeted help in four key areas of business networking, talent attraction, and connections with domain experts and funding partners. Vivek Kumar, assistant director-general of NTUC and director of NTUC's U Startup, said: "Many startups of today, as potential SMEs (small- and medium-sized enterprises) and unicorns, would collectively form significant employers of tomorrow. Hence, the Labour Movement is committed to support the startup ecosystem and lay the ground for our future workforce." 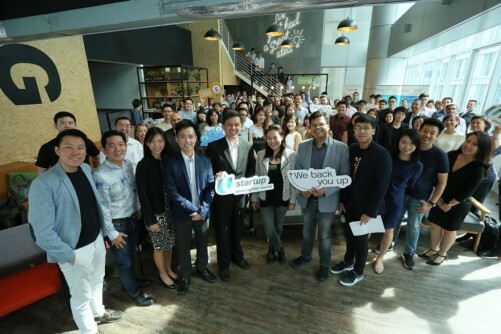 NTUC Secretary-General and Minister in the Prime Minister's Office Chan Chun Sing officiated the launch, and held a dialogue with startup founders at the event. Working professionals also benefited from a startup career fair organised by Action Community for Entrepreneurship and U Startup, featuring more than 300 full-time, part-time and internship positions in more than 100 startups. Speaking with reporters at the launch, Mr Chan said U Startup is intended to help workers in the new startup employment model as well as boost startups in their early stages. "The startup scene is very vibrant and it's attracting a lot of new workers into this new employment model. We want to make sure that all the workers in this sector are also taken care of," he said. At the same time, startups face challenges in attracting talent and launching their products into new markets, like any other small, new businesses. The U Startup network provides startup founders with a way to access the available manpower in Singapore and connect with other employers to synergise ideas, said Mr Chan. "It can be a win-win situation whereby the Labour Movement benefits from the new products and services while at the same time, we enable the startups to have sufficient skill to launch them onto the regional and global stage."